Its basic premise is that it adds a bunch of real-world rock types which overwrite 10-20% of vanilla stone. These rocks generate at realistic depths, and in realistic biomes (for example, shale and limestone, being silt/mud rocks, spawn more often in oceans, and cannot spawn in deserts). These stones cannot overwrite ores, nor do they block ores from spawning. Not all rocks are created equal; some are harder to mine and require better pickaxes. However, these ones also have greater blast resistances, with granite and hornfel being the hardest to destroy. Soft rock like shale is the most easily destroyed. 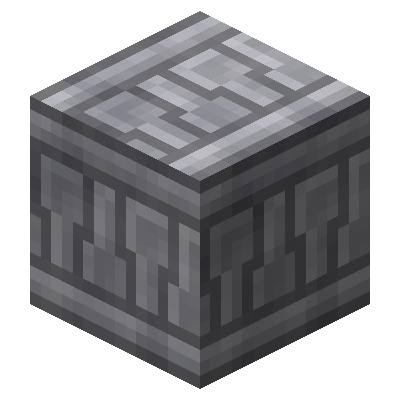 GeoStrata rock behaves like vanilla stone with pickaxes - it generates as smooth stone, drops cobblestone (unless using silk touch), can be smelted into smooth, and smooth can be crafted into bricks. A variety of other designs are also craftable. GeoStrata also generates vents in the floors of caves, including under bodies of liquid. Vents are normally dormant, but occasionally fire for a few seconds, emitting sound, particles, and giving various effects. All vents generate naturally in stone, with fire-type and gas vents occurring deeper underground. All vents also respond to redstone, and will trigger when given a positive edge. They can only be harvested with Silk Touch. Some vanilla blocks can also be crafted into brick variants, but keeping their original properties, like redstone, glowstone, and obsidian.